Because your most critical operations revolve around technology, you need an infrastructure that’s ready to support your changing workloads and organizational needs. Call to set up a consultation with a data center expert. At CDW, we have the experience, expertise and objectivity to help organizations build IT environments that are agile, manageable and future focused while keeping operations running smoothly and costs down. We’ll help you transform your IT into a strategic business driver, so you can focus on long-term, innovative projects rather than day-to-day operations. Read our exclusive report from IDG Research that explores how organizations are utilizing and benefitting from a hybrid IT approach. Learn how to minimize risk and reduce cost with a cloud environment. Atlantic Packaging changes its approach to IT upgrades and makes an investment in its future. 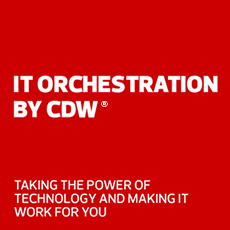 Why CDW Data Center Services? From simple hardware upgrades to complex, large-scale solutions, we’re ready for whatever challenges you throw our way. Our experts have experience with data center and networking solutions of all sizes. To evaluate your current environment, we offer data center assessments — led by our experts and our partners — as well as health checks, IT consulting and assessments to help with data migration. Cisco helps organizations seize the opportunities of tomorrow by proving that amazing things can happen when you connect the previously unconnected. Dell EMC enables organizations to modernize, automate and transform their data center using converged infrastructure, servers, storage and data protection technologies. Spanning the cloud to the data center to workplace applications, HPE’s technology and services help customers around the world make IT more efficient, more productive and more secure. Intel is transforming the data center with amazing new technologies to enable secure, wireless collaboration across a range of business-ready form factors, creating a better way to work. Call 800.800.4239 to set up a consultation with a data center expert.